Sometimes great things can happen when disaster strikes. Back in 1994 a small fire broke out in a barn that belonged to George Stranahan a beer brewer from outside of Denver. The one who came to help was Jess Graber a volunteer firefighter that not only saved the day but the two soon discovered that they share the same passion, love for outdoors and good ol’ fine Whiskey. It didn’t just stay at talk and soon after the first legal distillery in Colorado since prohibition was opened. Taking the mountain surrounding to their advantage they not only use the pure water coming down from snowy peaks but also the Rocky Mountain Barley that delivers the smooth flavor on which they are especially proud. 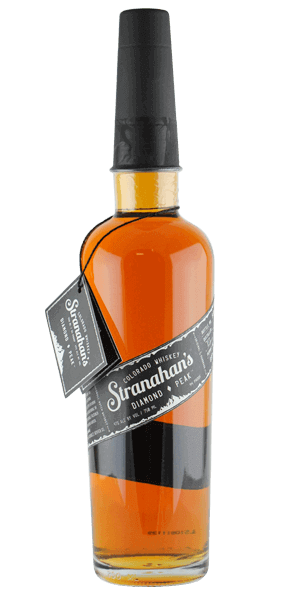 The Stranahan’s Diamond Peak is a blend of only chosen Whiskeys that bare age of at least 4 years. Made from 100% malted barley and aged in new charred oak barrels this Whiskey is Stranahan’s Creme de la Creme and quite limited because of that. Hint: Don’t miss this one! What does Stranahan's Diamond Peak taste like? The Flavor Spiral™ shows the most common flavors that you'll taste in Stranahan's Diamond Peak and gives you a chance to have a taste of it before actually tasting it. Sturdy aroma of caramel, baked cinnamon bread, toffee and some oaky malt. Cereals, tropical fruit with some sweet sugar like components. Creamy finish with some spices. Fantastic, the yellow label is really good and this one is even better. Delicious nose and caramel, toffee, and with a smooth light finish. Great hit if cherries in the nose with a cinnamon taste. Delivers on the early promise that Stranahan's showed before they scaled up and lost some mojo. Very good. My bottle was bottled at the original distillery and you can taste it. VERY good. Flavorful without a bite. Like it says in Flaviar's review: Hint: Don’t miss this one! Great whiskey! This is like whiskey candy to my mouth. A true single malt. Smoke and vanilla nose (probably a mix of the honey & caramel) taste. Finishes with a bit of fire but very smooth. Solid. Smooth. Just enough spice to make you remember that you still like spicy whiskey. Caramel is huge, honey and toffee notes, finishes with cinnamon. Bitter sweet but more on the bitter side in a very good way.